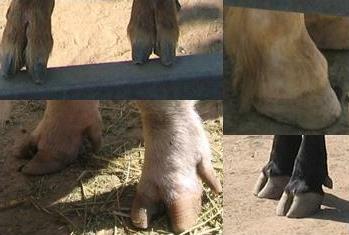 Examples of cloven hooves in goats (upper left), pigs (lower left) and cattle (lower right). But horses lack cloven hooves (upper right). Kosher dairy dishes from the 19th century in the Jewish Museum, Berlin. Label on bottle of orange juice certifying that it is kosher for Passover. A cocoon found among barleycorns in a commercially available bag of barley. Foods such as seeds, nuts and vegetables need to be checked to avoid eating insects. 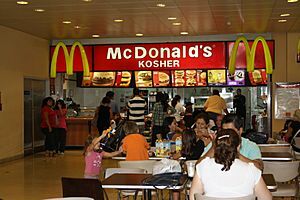 Kosher Facts for Kids. Kiddle Encyclopedia.